POBLENOU OPEN NIGHT 2018 23rd NOVEMBER! Urban music, contemporary art, ‘creative football’, sustainability and gastronomy are some of the novelties of the 2018 edition of the Poblenou Open Night! On 23rd of November, one of the most awaited nights of the year arrives: the Poblenou Open Night! For the fifth consecutive year, we will enjoy an evening where the creative community of Poblenou will open its doors to offer a wide variety of cultural proposals. 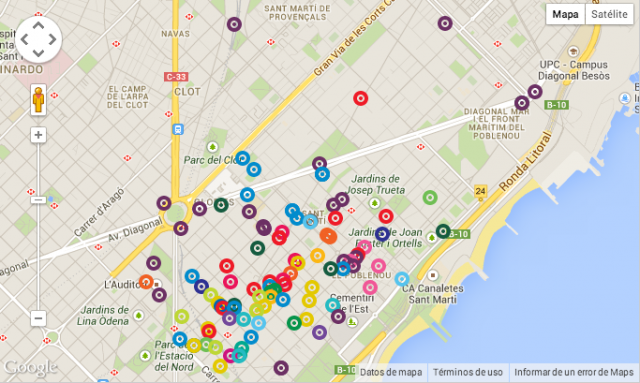 Art galleries, creation and training centers, studies of artists, audiovisual producers, gastronomic venues, shops and hotels will be part of the events, promoted from Poblenou Urban District, offering a program full of free activities and special promotions organized only for on this occasion. As every year, Poblenou Open Night will have the Windows Art Circuit, this year in special edition, and the Makerspaces Circuit. The Windows Art Circuit will feature a selection of artists who have accompanied us in previous editions. A celebration of the art that has consolidated the WAC as an annual event of reference in the artistic world and that wants to continue, for many more editions, giving new artists the opportunity to show their work in the city. The Makerspaces Circuit will allow lovers of sustainability and new forms of production to know the makers seated in Poblenou. Reuse, local production and sustainability are the keys to a new city model. We are very excited about the night dedicated to the trap and the new formats of distribution of musical and audiovisual contents by the producer Goroka in collaboration with El Bloque TV, which have revolutionized the music communication scene with their streaming programs, open to everyone. Also the performance of the Italian artist Katia Giuliani in the L & B gallery, and the opening of the exhibition ‘The Masks We Wear’ in the gallery Manifest Destiny Art. In the gallery La Plataforma we will find a boiler room and the installation of video art “Automatic Deliriums “by Joaquín Urbina. In Talleres Europa we will find a soccer tournament in the hands of the Newtown League creative league, a sports competition formed by studios, producers and agencies in Barcelona. In Indissoluble, you can enjoy your braindome of more than 8 meters and two tons of weight with a Led Mapping system that will leave you speechless! Palo Alto Foundation will open creative spaces with different activities around social action, sustainability and creativity. The foundation organizes for the occasion ‘Aprovechamos! Palo Alto Open Cata ‘, a culinary workshop against food waste with chef Sergi de Meià, the workshop’ Re-designed! ‘To generate ideas and create actions that help to apply circular economy strategies and reuse. Brother for Change organizes the colloquium ‘Houston, we have an opportunity’ that will talk about how to use creativity to generate solutions to social problems, open doors and exposure to the study of Javier Mariscal and a photography course for mobile phones, will be among others some of the activities that will be carried out within Palo Alto. We will also have several hot spots that will host the most powerful activities of the night. The urban gardens of The Gates Hotel will host some artists of the Windows Art Circuit with the rhythm of Tony Manero Sound System. In ROC35 there will be a showcooking with three chefs that during the evening will delight the attendees with different gastronomic proposals that will be paired with the best beers and live music. At BAU, the first edition of the “Innovation and Creation BAU Live Show” will be held, a secret live show that will present the most innovative and transgressive proposals born from the minds of the students of BAU, the leading university design center in our country. Receive our news every Thursday in your email about the Art and Creativity District of Barcelona. Poblenou Urban District.